My mum’s lentil soup. When we were children, we grew up in the wilds but somehow always knew when it was time to return to the house because we could smell mum’s lentil soup in the air. The people. I find the food community constantly extraordinary and wonderful. 1. St. John. You’ve got to have the bone marrow and parsley salad with toast. This delicious, evocative dish begat at last a greater understanding of and pleasure in British cooking. 2. Lyle’s. When a Young Turk, James Lowe impressed but now as a seasoned chef-restaurateur, he impresses mightily. 3. Clove Club. For exceptional, glamorous, and luxurious fun and games in the East End. Enhanced delightfully by Isaac McHale’s delicious food. 4. BAO. Which was just brilliant when it was a little shed in the East End, and is as good, neat, and elegant in its two restaurants, now in Soho and Fitzrovia. 5. The Marksman. These two intrepid cooks are just great, doing a brilliant job at trying to run a pub and also a great restaurant simultaneously. Hackney, it’s where I’ve lived for a great many years and it is always a pleasure to see how some quirky little places have become almost classics in a relatively short period of time, such as Rochelle Canteen, Leila’s and Brawn. 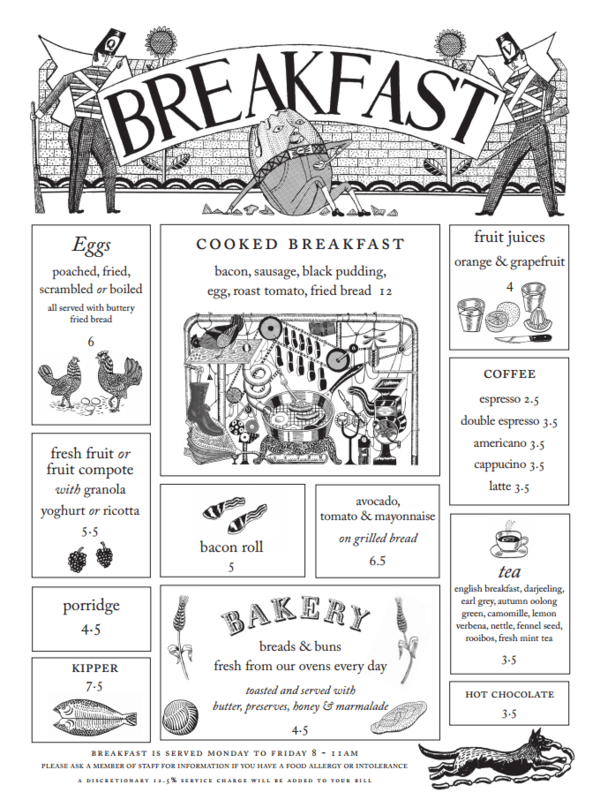 Breakfast: My favorite breakfast menu is Quo Vadis because of the brilliant work of illustrator John Broadley and designer Julian Roberts, who took my scribbles and thoughts and made a brilliant menu that’s as much fun to cook for as to eat from. I’d order a delicious porridge, lots of fresh bread and our jams, great kipper cakes, and a fried egg. I’m a growing boy. Oh and lots of Postcard teas. Elevenses: Has to be madeira cake, a glass of madeira, and a coffee at St. John. Lunch: River Café, if possible on the terrace with a very fierce appetite and not too shabby a thirst either. Particularly in the autumn with ceps and truffles, in the summer for beautiful salads and amazing pasta with agretti and bottarga. Or the best roast turbot in town. Afternoon tea is a coffee éclair at Maison Bertaux. Then a Negroni and baked salsify back at Quo Vadis. Dinner: To Hereford Road where Tom Pemberton cooks the most delightful artichoke vinaigrette in town and is the most delightful man. If you had to name one personal favorite dish from Quo Vadis, which would it be and why? 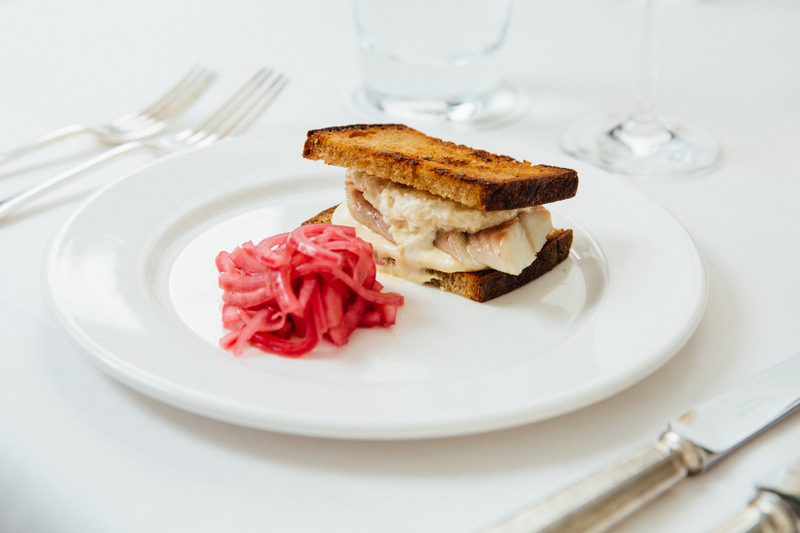 The smoked eel sandwich. It’s a dish that’s an old friend and remains a wonderful mystery that a sandwich should be the dish that flies our flag higher than most. You grew up eating great home cooking. The pudding served at Quo Vadis is a nod to your father’s love of pudding, complete with the custard and cream that he always insisted on having. Are there any other dishes at Quo Vadis that incorporate the flavors of your childhood? There are. The great smoked herrings such as bloaters and buckling that so delighted my father feature regularly. I have great fun playing with pastry, as I have lingering memories of my mother’s extraordinary talent with the stuff. From delicious tarts to the rather curious and moreish kickshaws. Silk Road in Camberwell for noodles and everything. Gerrard’s Corner on Gerrard Street in Chinatown for cheap dim sum. Nieves Barragan Mohacho’s milk fed lamb’s kidneys served on a little grill at Barrafina Adelaide Street. It’s a really cracking dish that. Since it’s London, we have to ask: where do you go for the best Sunday roast? For a classic London experience I’d go to the The Goring Hotel and get the classic roast on the trolley. A beautiful airy room that never fails to delight. Not so much guilty as a full fat pleasure is Gujarati Rasoi at Broadway Market, where I go on a Saturday Market. This for me has to be the best Indian takeout in the whole city. Do you have any favorite watering holes you like to frequent? The French House for a glass of chambéry on ice with a sliver of lemon. The Crown Jewels at the Tower, of course. She even has her own escalator. For the most delightfully original restaurant, bar and eatery in London one should always visit dear Jackson Boxer at Brunswick House, housed within an ancient old mansion partnered with LASSCO, the architectural salvage gurus, who fill the place with the most extraordinary collections of antiques of all sorts. Quo Vadis, 26-29 Dean Street (Soho); modern British, breakfast Monday-Friday, lunch and dinner Monday-Saturday, closed Sunday. St. JOHN Bar & Restaurant, 26 St. John Street (Smithfield); modern British, lunch Sunday-Friday, dinner Monday-Saturday. Lyle’s, 56 Shoreditch High Street (Shoreditch); modern British, lunch and dinner Monday-Saturday, closed Sunday. The Clove Club, Shoreditch Town Hall, 380 Old Street (Shoreditch); modern British, lunch Tuesday-Saturday, dinner Monday-Saturday, closed Sunday. The Marksman, 254 Hackney Road (Hackney); British pub and dining room, breakfast Saturday-Sunday (pub), lunch Friday-Sunday (pub) and Saturday-Sunday (dining room); dinner Tuesday-Saturday. Rochelle Canteen, Rochelle School (Shoreditch); modern British, breakfast and lunch Monday-Friday, closed Saturday-Sunday. Leila’s Shop, 17 Calvert Avenue (Hackney); cafe, open 10 a.m.-6 p.m. Wednesday-Sunday, closed Monday-Tuesday. Brawn, 49 Columbia Road (Hackney); European, lunch Tuesday-Sunday, dinner Monday-Saturday. St. John Bread and Wine, 94-96 Commercial Street (Spitalfields); British, breakfast, lunch, and dinner daily. The River Cafe, Thames Wharf, Rainville Road (Hammersmith); Italian, lunch daily, dinner Monday-Saturday. Maison Bertaux, 28 Greek Street (Soho); patisserie, open daily. Hereford Road, 3 Hereford Road (Westbourne Grove); modern British, lunch and dinner daily. Gerrard’s Corner, 30 Wardour Street (Chinatown); Chinese, dim sum and dinner daily. Barrafina, 10 Adelaide Street (Covent Garden); lunch and dinner daily. The Dining Room at The Goring Hotel, 15 Beeston Place (Belgravia); modern British, breakfast and dinner daily, lunch Sunday-Friday. Gujarati Rasoi at Broadway Market (Hackney); Indian, open 9 a.m.-5 p.m. Saturday only. Second market location: Borough Market (Southwark); open Monday-Saturday, closed Sunday. Restaurant location: 10C Bradbury Street (Hackney); dinner only Tuesday-Saturday, closed Sunday-Monday. The French House, 49 Dean Street (Soho); bar, open daily, lunch Monday-Friday. Tower of London, open daily. Brunswick House, 30 Wandsworth Road (Vauxhall); British, lunch daily, dinner Monday-Saturday. About the Chef: Long before Jeremy Lee became the Head Chef of London’s legendary Quo Vadis, he started out his restaurant career as a waiter in his hometown. It was a job he says he didn’t enjoy, and as fate would have it, Lee was soon moved to the kitchen. Since then, he has worked at Bibendum with Simon Hopkinson and Blueprint Café in the Design Museum, where he spent 18 years. In 2012, Lee joined Quo Vadis, a restaurant which has been in existence since the 1920s. The menus, which are uniquely illustrated by John Broadley, feature modern British dishes, old favorites, and foods that evoke childhood memories for Lee.